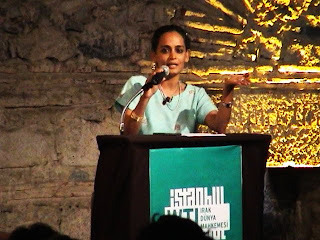 Arundhati Roy asks what would independence mean to the people of Kashmir? This article appeared in the Guardian on Friday August 22 2008 on p6 of the Comment & features section. It was last updated at 10:09 on August 22 2008. For the past 60 days or so, since about the end of June, the people of Kashmir have been free. Free in the most profound sense. They have shrugged off the terror of living their lives in the gun-sights of half a million heavily armed soldiers, in the most densely militarized zone in the world. A sudden twist of fate, an ill-conceived move over the transfer of 100 acres of state forest land to the Amarnath Shrine Board (which manages the annual Hindu pilgrimage to a cave deep in the Kashmir Himalayas) suddenly became the equivalent of tossing a lit match into a barrel of petrol. Until 1989 the Amarnath pilgrimage used to attract about 20,000 people who travelled to the Amarnath cave over a period of about two weeks. In 1990, when the overtly Islamist militant uprising in the valley coincided with the spread of virulent Hindu nationalism (Hindutva) in the Indian plains, the number of pilgrims began to increase exponentially. By 2008 more than 500,000 pilgrims visited the Amarnath cave, in large groups, their passage often sponsored by Indian business houses. To many people in the valley this dramatic increase in numbers was seen as an aggressive political statement by an increasingly Hindu-fundamentalist Indian state. Rightly or wrongly, the land transfer was viewed as the thin edge of the wedge. It triggered an apprehension that it was the beginning of an elaborate plan to build Israeli-style settlements, and change the demography of the valley. Days of massive protest forced the valley to shut down completely. Within hours the protests spread from the cities to villages. Young stone pelters took to the streets and faced armed police who fired straight at them, killing several. For people as well as the government, it resurrected memories of the uprising in the early 90s. Throughout the weeks of protest, hartal (strikes) and police firing, while the Hindutva publicity machine charged Kashmiris with committing every kind of communal excess, the 500,000 Amarnath pilgrims completed their pilgrimage, not just unhurt, but touched by the hospitality they had been shown by local people. Eventually, taken completely by surprise at the ferocity of the response, the government revoked the land transfer. But by then the land-transfer had become what Syed Ali Shah Geelani, the most senior and also the most overtly Islamist separatist leader, called a "non-issue". Massive protests against the revocation erupted in Jammu. There, too, the issue snowballed into something much bigger. Hindus began to raise issues of neglect and discrimination by the Indian state. (For some odd reason they blamed Kashmiris for that neglect.) 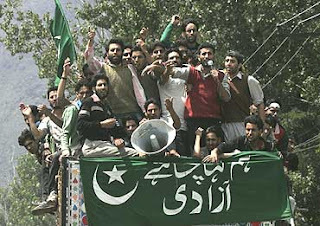 The protests led to the blockading of the Jammu-Srinagar highway, the only functional road-link between Kashmir and India. Truckloads of perishable fresh fruit and valley produce began to rot. The blockade demonstrated in no uncertain terms to people in Kashmir that they lived on sufferance, and that if they didn't behave themselves they could be put under siege, starved, deprived of essential commodities and medical supplies. To expect matters to end there was of course absurd. Hadn't anybody noticed that in Kashmir even minor protests about civic issues like water and electricity inevitably turned into demands for azadi, freedom? To threaten them with mass starvation amounted to committing political suicide. Not surprisingly, the voice that the government of India has tried so hard to silence in Kashmir has massed into a deafening roar. Raised in a playground of army camps, checkpoints, and bunkers, with screams from torture chambers for a soundtrack, the young generation has suddenly discovered the power of mass protest, and above all, the dignity of being able to straighten their shoulders and speak for themselves, represent themselves. For them it is nothing short of an epiphany. Not even the fear of death seems to hold them back. And once that fear has gone, of what use is the largest or second largest army in the world? There have been mass rallies in the past, but none in recent memory that have been so sustained and widespread. The mainstream political parties of Kashmir - National Conference and People's Democratic party - appear dutifully for debates in New Delhi's TV studios, but can't muster the courage to appear on the streets of Kashmir. The armed militants who, through the worst years of repression were seen as the only ones carrying the torch of azadi forward, if they are around at all, seem content to take a back seat and let people do the fighting for a change. That sound reverberates through the valley like the drumbeat of steady rain on a tin roof, like the roll of thunder during an electric storm. On August 15, India's independence day, Lal Chowk, the nerve centre of Srinagar, was taken over by thousands of people who hoisted the Pakistani flag and wished each other "happy belated independence day" (Pakistan celebrates independence on August 14) and "happy slavery day". Humour obviously, has survived India's many torture centres and Abu Ghraibs in Kashmir. On August 16 more than 300,000 people marched to Pampore, to the village of the Hurriyat leader, Sheikh Abdul Aziz, who was shot down in cold blood five days earlier. On the night of August 17 the police sealed the city. Streets were barricaded, thousands of armed police manned the barriers. The roads leading into Srinagar were blocked. On the morning of August 18, people began pouring into Srinagar from villages and towns across the valley. In trucks, tempos, jeeps, buses and on foot. Once again, barriers were broken and people reclaimed their city. The police were faced with a choice of either stepping aside or executing a massacre. They stepped aside. Not a single bullet was fired. The city floated on a sea of smiles. There was ecstasy in the air. Everyone had a banner; houseboat owners, traders, students, lawyers, doctors. One said: "We are all prisoners, set us free." Another said: "Democracy without freedom is demon-crazy." Demon-crazy. That was a good one. Perhaps he was referring to the insanity that permits the world's largest democracy to administer the world's largest military occupation and continue to call itself a democracy. For somebody like myself, who is not Muslim, that interpretation of freedom is hard - if not impossible - to understand. I asked a young woman whether freedom for Kashmir would not mean less freedom for her, as a woman. She shrugged and said "What kind of freedom do we have now? The freedom to be raped by Indian soldiers?" Her reply silenced me. Surrounded by a sea of green flags, it was impossible to doubt or ignore the deeply Islamic fervour of the uprising taking place around me. It was equally impossible to label it a vicious, terrorist jihad. For Kashmiris it was a catharsis. A historical moment in a long and complicated struggle for freedom with all the imperfections, cruelties and confusions that freedom struggles have. This one cannot by any means call itself pristine, and will always be stigmatised by, and will some day, I hope, have to account for, among other things, the brutal killings of Kashmiri Pandits in the early years of the uprising, culminating in the exodus of almost the entire Hindu community from the Kashmir valley. Why was it so galling, so painful to listen to this? I tried to work it out and settled on three reasons. First, because we all know that the first part of the slogan is the embarrassing and unadorned truth about India, the emerging superpower. Second, because all Indians who are not nanga or bhooka are and have been complicit in complex and historical ways with the elaborate cultural and economic systems that make Indian society so cruel, so vulgarly unequal. And third, because it was painful to listen to people who have suffered so much themselves mock others who suffer, in different ways, but no less intensely, under the same oppressor. In that slogan I saw the seeds of how easily victims can become perpetrators. Syed Ali Shah Geelani began his address with a recitation from the Qur'an. He then said what he has said before, on hundreds of occasions. The only way for the struggle to succeed, he said, was to turn to the Qur'an for guidance. He said Islam would guide the struggle and that it was a complete social and moral code that would govern the people of a free Kashmir. He said Pakistan had been created as the home of Islam, and that that goal should never be subverted. He said just as Pakistan belonged to Kashmir, Kashmir belonged to Pakistan. He said minority communities would have full rights and their places of worship would be safe. Each point he made was applauded. I imagined myself standing in the heart of a Hindu nationalist rally being addressed by the Bharatiya Janata party's (BJP) LK Advani. Replace the word Islam with the word Hindutva, replace the word Pakistan with Hindustan, replace the green flags with saffron ones and we would have the BJP's nightmare vision of an ideal India. Is that what we should accept as our future? Monolithic religious states handing down a complete social and moral code, "a complete way of life"? Millions of us in India reject the Hindutva project. Our rejection springs from love, from passion, from a kind of idealism, from having enormous emotional stakes in the society in which we live. What our neighbours do, how they choose to handle their affairs does not affect our argument, it only strengthens it. Arguments that spring from love are also fraught with danger. It is for the people of Kashmir to agree or disagree with the Islamist project (which is as contested, in equally complex ways, all over the world by Muslims, as Hindutva is contested by Hindus). Perhaps now that the threat of violence has receded and there is some space in which to debate views and air ideas, it is time for those who are part of the struggle to outline a vision for what kind of society they are fighting for. Perhaps it is time to offer people something more than martyrs, slogans and vague generalisations. Those who wish to turn to the Qur'an for guidance will no doubt find guidance there. But what of those who do not wish to do that, or for whom the Qur'an does not make place? Do the Hindus of Jammu and other minorities also have the right to self-determination? Will the hundreds of thousands of Kashmiri Pandits living in exile, many of them in terrible poverty, have the right to return? Will they be paid reparations for the terrible losses they have suffered? Or will a free Kashmir do to its minorities what India has done to Kashmiris for 61 years? What will happen to homosexuals and adulterers and blasphemers? What of thieves and lafangas and writers who do not agree with the "complete social and moral code"? Will we be put to death as we are in Saudi Arabia? Will the cycle of death, repression and bloodshed continue? History offers many models for Kashmir's thinkers and intellectuals and politicians to study. What will the Kashmir of their dreams look like? Algeria? Iran? South Africa? Switzerland? Pakistan? At a crucial time like this, few things are more important than dreams. A lazy utopia and a flawed sense of justice will have consequences that do not bear thinking about. This is not the time for intellectual sloth or a reluctance to assess a situation clearly and honestly. Already the spectre of partition has reared its head. Hindutva networks are alive with rumours about Hindus in the valley being attacked and forced to flee. In response, phone calls from Jammu reported that an armed Hindu militia was threatening a massacre and that Muslims from the two Hindu majority districts were preparing to flee. Memories of the bloodbath that ensued and claimed the lives of more than a million people when India and Pakistan were partitioned have come flooding back. That nightmare will haunt all of us forever. However, none of these fears of what the future holds can justify the continued military occupation of a nation and a people. No more than the old colonial argument about how the natives were not ready for freedom justified the colonial project. Of course there are many ways for the Indian state to continue to hold on to Kashmir. It could do what it does best. Wait. And hope the people's energy will dissipate in the absence of a concrete plan. It could try and fracture the fragile coalition that is emerging. It could extinguish this non-violent uprising and re-invite armed militancy. It could increase the number of troops from half a million to a whole million. A few strategic massacres, a couple of targeted assassinations, some disappearances and a massive round of arrests should do the trick for a few more years. The unimaginable sums of public money that are needed to keep the military occupation of Kashmir going is money that ought by right to be spent on schools and hospitals and food for an impoverished, malnutritioned population in India. What kind of government can possibly believe that it has the right to spend it on more weapons, more concertina wire and more prisons in Kashmir? The Indian military occupation of Kashmir makes monsters of us all. It allows Hindu chauvinists to target and victimize Muslims in India by holding them hostage to the freedom struggle being waged by Muslims in Kashmir. India needs azadi from Kashmir just as much as - if not more than - Kashmir needs azadi from India. · Arundhati Roy, 2008. A longer version of this article is available at outlookindia.com. Riaz, this reader is sorely disappointed that you would give space to someone like Arundhati Roy. Her writing makes out like she's on the Indian side and her heart just "breaks" when she hears anti-Indian slogans. Truth is she's a calculating left-wing not-so-loonie who's not averse to running over the rights of the people she pretends to champion. She and her husband (2nd one) built a home on tribal land and hoped to get away with it. She'd like to be cast as a loony-left, idealistic anarchist. In reality she is anything but. We've already discussed Kashmir, so I won't go there. But Ms Roy has a tendency to show up in all hot spots (Narmada Valley, Kashmir) like a zit that won't quit. She's a media whore who cannot get enough of herself. Publishing her inane comments verbatim hurts your credibility. She's no bleeding-heart liberal - she's just a (minor) Goddess of Small Intrigues. I believe Roy is an independent thinker and a gadfly who refuses to toe the Indian government's or the mainstream Indian media's propaganda line. There are very few people like her in Pakistan (e.g. Pervez Hoodbhoy) but I really wish Pakistan had more independent thinkers and gadflies like her to challenge the conventional views and thinking in Pakistan. You may agree or disagree with her views but she is presenting the facts as she has recently seen them in Kashmir. I am disappointed that, instead of disputing the facts or rebutting her, you chose to just dismiss her out of hand and attack her in a very personal way. I believe the latest mass protests are a groundswell from within Kashmir and represents a genuine desire of ordinary Kashmiris for separation from India. Blaming it on external factors would prove to be big folly. she is a attention crazy person..
nobody gives a dime for what she thinks..
of course she could be given a booker for articulation and imagination but not for intellect. She gives a damn for Narmada,Kashmir or Gujarat riots or anything for that matter. Definitely she is entitled to her views. Jammu vs Kashmir issue is virtually solved with land allocation issue resolved.If Srinagar population wants to dig their grave by shouting out investment and tourists, by self-defeating azadi protests, its their choice. Pak surprisingly isnt doing much in Kashmir except pushing some terrorists for some massacres. If you can observe it, there is a deafening silence about Kashmir from West and you know why. They dont want another Al-Queda academy in any part of the world. They surely have learnt their lessons. I am disappointed to see the usage of terms like 'mdeia whore' by libertarian. Riaz - you are guilty of earning her that title..hah. She can easily do what Salman Rushdi or many other right wingers have done to get the media attention..but..why is she siding with people who are themselves a victim of a media bias. Its not a question of who is right and who is wrong, its a question of defeating our own bias and our own prejudice and do it right by the people. But let's give some credit to the Indian system that tolerates iconoclasts like Roy. Other than Hoodbhoy, I don't see any examples in Pakistan. Riaz, I feel compelled to respond, even though presenting a case against Ms Roy is akin to dredging sludge from a sewer. For the past 60 days or so, since about the end of June, the people of Kashmir have been free. Free in the most profound sense. *yawn* - usual hyperbole from someone who makes a living off of it. Having declared that the militant movement has been crushed, it is now faced with a non-violent mass protest, but not the kind it knows how to manage. Actually, as incompetent as successive Indian governments have been, they've managed to blunt violent and non-violent secessionist movements quite successfully. Tamil Nadu in the 1960s is a great example. Kashmir would have been the same were it not for Pakistan's "moral support" and Saudi money. That kind of rage, once it finds utterance, cannot easily be tamed, rebottled and sent back to where it came from. On the contrary. The rage is manufactured to a large extent. The Hurriyat is deadly scared of elections scheduled in 2 months - more irrelevance for them - so the Amarnath fiasco was a gift from the bumblers in Srinagar. It triggered an apprehension that it was the beginning of an elaborate plan to build Israeli-style settlements, and change the demography of the valley. Umm yes of course. Anyone who buys that line can also be sold the Brooklyn Bridge. Amarnath is a icy wasteland. If the intent resettlement why target the middle of nowhere - move the pilgrims right into Srinagar or Anantnag, no? Throughout the weeks of protest, hartal (strikes) and police firing, while the Hindutva publicity machine charged Kashmiris with committing every kind of communal excess, the 500,000 Amarnath pilgrims completed their pilgrimage, not just unhurt, but touched by the hospitality they had been shown by local people. And who's word do we have for that? Oh yes - Ms Roy. Ha ha. A kid from Anantnag (who I employed) told me that they've been stoning Amarnath pilgrims for years now. So much for hospitality. But by then the land-transfer had become what Syed Ali Shah Geelani, the most senior and also the most overtly Islamist separatist leader, called a "non-issue". Of course. All that latent hatred came bubbling out. Sounds suspiciously similar to the "spontaneous protests" by Shiv Sainiks when Bal Thackeray was hauled into the courts for the 1993 Mumbai riots. Even the Mirwaiz, Yasin Malik and Shabbir Shah were pi$$ed off with Geelani for trying to hijack the "movement". Not surprisingly, the voice that the government of India has tried so hard to silence in Kashmir has massed into a deafening roar. Ms Roy is the choir here. According to Masarat Alam - Geelani's right-hand man - the people of Srinagar needed time to recharge so they could come out with another show of force. Sounds like manufactured rage to this observer. Also points to a very real fear of azadi fatigue among the population. Stick to the facts Ms Roy - gp easy on the drama. Ha! Luckily for her she did not assert it was the Indian security forces that did it (though she clearly implied it). Turns out this dude was shot in the back (while facing the security forces) and had a terribly hasty burial. Nice going Hurriyat - manufacture a shaheed for the occasion. Convenient of Ms Roy to forget about the 35% of J&K which is non-Muslim and will have nothing to do with Islamism. And that does count the several hundred thousand Kashmiri Pandits who do not live in J&K through no choice of their own. India needs azadi from wack-jobs like Ms Roy. Her contribution to any discourse is usually to throw a spanner in the works. Arriving at a lasting solution is not in her interest - she cannot write her vicious lyrical prose about dead issues. She'd have serious withdrawal symptoms if Kashmir were actually solved. Putting her in the same boat as Hoodbhoy is an insult to the rational Hoodbhoy. She desperately needs a invitation to speak on some international forums. If riaz needs "objectivity" you can also check out teesta setvald,painter hussain,tehelka.com or N.Ram's "Hindu" newspaper..(one of his piece gatecrashed into syllabus of chinese "re-education camps"..i hav absolutely no idea why it is termed as "hindu" paper..its called "People's Daily" in intelligence circles).. Even "the nation.com.pk", saudinews or for that matter an al-jazeera can't match objectivity of some indian observers. I am personally not against other opinions..but when an op-ed bends "facts" to an such an extent..and inserts whimsical "truths"..you got to respond..though its serves no purpose and convinces none..
As a soldier who served in Kashmir, Ms Roy's statements are truly galling. After painting us all as vicious murderers, rapists and thieves she talks about peaceful protests. Were we the vicious sadists she claims us to be would those police have stepped aside? Would those soldiers at the roadblocks and checkpoints have allowed the protesters to so blatantly shout slogans for the enemy? War is war and during the years of the insurgency (which still claim the lives of my brothers) many awful things were done on all sides. If Kashmir ever get the Pakistani notion of 'azadi' that Ms Roy wants I think all the bleeding heart liberals will be in for quite a shock when the Lashkar-e-Toiba and their ilk descend to enact the 'Islamic' ideals that Kashmiri independence merits. Arundati roy is the Indian loony left's equivalent of Ann Coulter. You can't ignore her, but is difficult to take her seriously. she says non-violent protests are un-manageable. Hillarious. Civil disobedience only works when the Govt depends on the people to contribute to the economy. If the people stop work, then the economy & the civil structure grounds to a stand-still. That's not the case with Kasmir. In India we're happy to see that the counter insurgency of the our military has worked well, starved the separtists of financial & military support from across the LOC. Now they resort to Gandhi's way. What a sham... But atleast they are coming to their senses. Azadi has been given a quite burial. The rest of the country can now get on with the normal business.